Since bullet trains will be giving direct competition to domestic flights in the country, NHSRCL is thinking about airport-like security at stations. 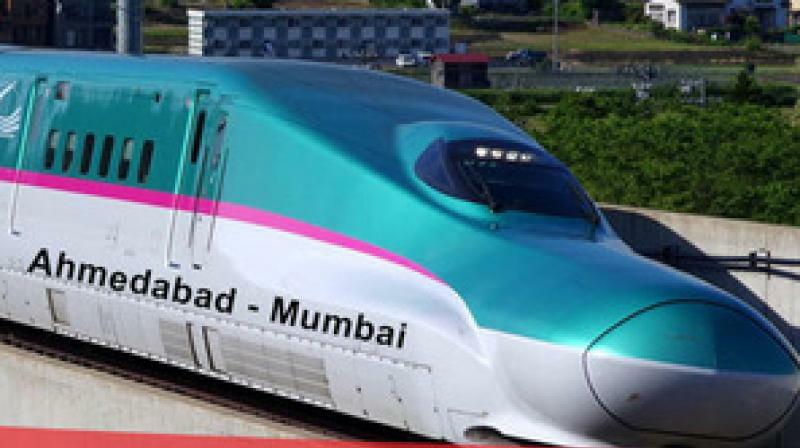 NEW DELHI (Metro Rail News): National High-Speed Rail Corporation Limited (NHSRCL) implementing the high-speed rail corridor project between Ahmedabad and Mumbai recently invited bids for 237 km out of 508 km-long corridors. In March 2019 we reported,that Two 50-m training track slabs made from high strength concrete have been readied at High-Speed Rail Training Institute (HSRTI) using Japan’s Shinkansen (Japanese bullet train) technology. The official target for the completion of this corridor is August 2022. While the train is designed to operate at a speed of 350 kilometers per hour, it will be running at a maximum speed of 320 kilometers. The high-speed train will be cutting down the travel time between Mumbai and Ahmedabad by 5 hours. As per a recent HT report, Central Industrial Security Force (CISF) is helping the National High-Speed Rail Corporation (NHSRCL) to finalise security measures for bullet train project. It was stated in the report that since bullet trains will be giving direct competition to domestic flights in the country, NHSRCL is thinking about airport-like security at stations. They are planning to allow passengers to enter the platform just before the scheduled departure of the train. “We provide security consultancy to many establishments and since this will be the first bullet train project for India, NHSRCL has approached us for consultancy. We will review the security structure of (high-speed trains in) other countries and will suggest a measure accordingly.” Said CISF officials. “That since all the bullet train stations will be interconnected with railway stations, RPF might be given the responsibility of security for bullet train passengers as well.” NHSRCL spokesperson Sushma Gau. She also mentioned that CISF will be suggesting surveillance structure, deployment pattern, the requirement for quick reaction teams, etc. Prime Minister Narendra Modi laid the foundation stone for the bullet train project last year with Japanese counterpart Shinzo Abe. While the project is expected to be complete by 2023, a report from October 2018 suggested that the project might miss the 2023 deadline because of delays in the initial land acquisition process.